VERY GOOD CONDITION - THE MG LE500 PLATE HAD A VERY SMALL 23000 MILES ON THE CLOCKS AND IS REFLECTED IN THE ITEM. NAC (CHINESE OWNED) MG TF ONLY. We will ALWAYS try our best to help. S’adapte MG MGF & TF 1995-2006. S’il vous plaît ce faire par téléphone pour convenir d’un rendez-vous. 50769 Köln. Cadre no YWC106240 & NNN100783. Pour tous les modèles. Mg Tf 2005 Complete Ecu Set. Off a 1.8 non vvC car.all in good working order. Mg tf automatic gearbox ecu off a running car with no problems. Model - MG TF. Constructeur - MG. Année - 2003. Code moteur - 16K4F. Type moteur - 115 / 16K4F. N° de châssis - SARRDMBEM3D618736. Numéros originaux - 3D618736, NNN100783, NNW005830. Fabriqué jusqu'en - 2009-12-01. PART NUMBER: NNN100743. Fits MG MGF / TF models from vin range 639329 with both manual and auto gearbox. About Moss…. Specialising in Austin-Healey, Classic Mini, Jaguar, Mazda MX-5, MG, Morris & Triumph. YWC106240 & NNN100783. Sofern es sich um Gebrauchtware handelt, erhalten Sie selbstverständlich eine Gewährleistung von einem Jahr. passend für MG MGF & TF 1995 - 2006. Wir freuen uns auf Ihren Besuch. VERY GOOD CONDITION - THE MG LE500 PLATE HAD A VERY SMALL 23000 MILES ON THE CLOCKS AND IS REFLECTED IN THE ITEM. NAC (CHINESE OWNED) MG TF ONLY. neutral or. 2003 Porsche 996 3.6 Carrera 4S Accelerator Throttle Pedal Unit. 2003 Porsche 996 3.6 Carrera 4S Air-Con Line. 2003 Porsche 996 3.6 Carrera 4S Air-con Pipe. 2003 Porsche 996 3.6 Carrera 4S Air-Con Pipe. Genuine MG part in good used clean working condition. All our panel parts and trims are checked to see the fixings are in tact. Part Number: NNN000060. Part: 1.8 Non VVC Engine ECU. Model:MG F // MG TF. It represents the standard we aspire to achieve on goods marked as such. With a plethora of parts available on the shelf, we should have the part you require. Best of Rover Spares LTD. Prices remain in force until we publish new prices on our website. 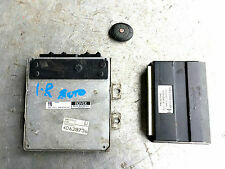 2002 MG TF MGTF 1.6 Moteur 115 BHP ECU Set NNN000060 avec 1 fab. Genuine MG part in good used clean working condition this item will need coding in. MG TF MGTF LE500 1.6 1.8 - Parking Capteur ECU. We will ALWAYS try our best to help. neutral or. Other locations will be more expensive. All parts are matched, so ready to fit with no coding required. Transponder No: YWD100080. Complete ECU kit for MG TF 1.6 115bhp vehicles WITHOUT ABS. Alarm ECU Part No: YWC000980. ECU Part No: YWC00720. For MG TF from chassis No. 600101 on. Removed from a 6,000 mile 1999 MGF facelift pre -production prototype No. 808 with automatic transmission. These will fit ALL MGF and MG TF Models! In very good condition. Price includes bench programming - (Data transfer from your unit to this donor unit)to do this you will have to send us your old unit, then this unit will plug straight in and work with your existing keys with no further programming necessary. Engine ECU. Part Number NNN000060. 2004 MG TF ECU. This item has been removed from a: 2004 MG TF. Part Type: ECU. Year: 2004. Unless otherwise stated, Due to the nature of our parts being sourced from dismantled vehicles, there is a possibility that impact data/faults may be present. Part Number: MKC104001. Part: Manual 1.8Petrol Litre VVC Engine ECU. Model:MGF // MG TF. Fully working when taken off vehicle. We will do all we can to help you identify the correct part if you ask us. All parts are tested where possible. Unless otherwise stated the item in the picture is the one you will receive. WHO ARE WE?. Help us keep your car going for longer! Helpful information:- We believe this part fits VARIOUS MODELS. May Have Minor Visible Usage Marks On It And May Need Cleaning. Working Order/Sold As Per Picturebasic. It is a complete Set. Fit for all Years for all Cars. Now You have automatically light at night if you leave your Car or coming to your Car. So thet you have Light at Night if you leave or coming to your Car. 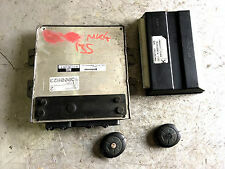 Item Specifics:2002-2010 - MK1 - 2 DOOR - CONVERTIBLE - AIRBAG ECU - 105230. This ECU was removed from a2003 car and has been fully inspected. Part Number: NNN100783. Part: 1.6 & 1.8 Non VVC Engine ECU. Passend für MG MGF 1995 - 2001. Sofern es sich um Gebrauchtware handelt, erhalten Sie selbstverständlich eine Gewährleistung von einem Jahr. Wir freuen uns auf Ihren Besuch. // Bilder dienen der Illustration, sind evtl. YWC103040 (1337). CHECK PART NUMBER/PICTURE BEFORE YOU BUY IT. AND MAKE SURE IT WILL FIT YOUR CAR. The part is used but in full working order. Original MG ROVER Relaismodul in der letzten verbesserten Ausführung. Ersetzt alle vorherigen Teilenummern (YWB100970) (YWB100970L) (YWB100710) (AMR5913). (YWB100970). AND MAKE SURE IT WILL FIT YOUR CAR. CHECK PART NUMBER/PICTURE BEFORE YOU BUY IT. The part is used but in full working order. THIS DOES NOT INCLUDE.